The Valley Wind Ensemble is a non-profit community-oriented organization dedicated to providing concert band music throughout the Santa Ynez Valley. Under the direction of Sharon Jeskey, the ensemble consists of about 35 musicians with a wide range in age, experience and interests. Originally organized in 1990, it has performed free concerts for the community and Atterdag Village, a senior retirement home, and also takes part in a number of public events such as July 4th, Julefest, and most recently, Solvang's Centennial celebration which included festivities for the Prince of Denmark, and many other various events. We encourage and welcome new members without audition. Rehearsals are Thursday evenings at 7:00-9:15 pm in the Santa Ynez Valley High School music room. Contact Sid Goldstien at (805) 688-8728 for more information or visit the Members page for more information. 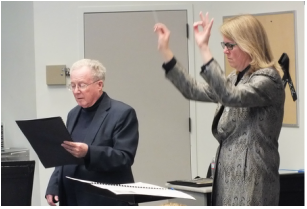 ​Sharon M. Jeskey received her Master of Music degree in instrumental conducting from the University of Missouri, Kansas City Conservatory of Music. There she studied conducting with Gary W. Hill (currently director of bands at Arizona State University). Jeskey also holds a Bachelor of Music Education degree from California State University, Long Beach, where she studied conducting with Larry G. Curtis (currently director of The Municipal Band). Ms. Jeskey began her musical career in Southern California teaching music to junior and high school students, while managing United States operations of an Australian Music company. From 1996 - 2003, Ms. Jeskey taught at Santa Ynez Valley High School, Solvang School, and Ballard School. Her duties included educating students in grades 4-12 as well as running school chamber ensembles, a Valley-wide junior jazz band and the Fourth of July Youth Band. Ms. Jeskey is now the instrumental music teacher at San Luis Obispo High School and Laguna Middle School. Her duties include directing the concert band, marching band, jazz band, and teaching middle school band classes. Jeskey is an active guest conductor. She has appeared with the USAF Band of the Golden West, several university bands (University of Nevada Symphonic band and California State University, Northridge Symphonic Band), and local orchestras such as the West Coast Symphony and the Santa Maria Symphony. Dedicated to the institution of music education, she is an active member of the College Band Directors National Association, National Association for Music Education, and the Southern California School Band and Orchestra Association. ​What is a Wind Ensemble? Have you ever been confused by the terminology of musical performing groups? No doubt, because there are so many terms, several of them referring to the same entity, i.e. Orchestra, Wind Ensemble, Concert Band, or Symphonic Band. This article is written to mainly delineate the terms for “band” ensembles, but I must mention that the term “Orchestra” is almost exclusively for an ensemble with the predominance of string instruments. However, that being said there are some “bands” that call themselves “Wind Orchestras.” The word “band” may refer to any gathering of instrumental musicians. The contemporary American “band” is understood to mean a mixed group of musicians who play woodwind, brass, and percussion instruments. * The following ensembles are all considered bands: Concert Band, Symphonic Band, Wind Symphony, Wind Orchestra, and Wind Ensemble. Even though there are so many different names, they all pretty much mean the same thing, except for the term “Wind Ensemble.” Most bands have a large instrumentation of 60 or more members. Beginning in the early 20th century in America, bandmasters attempted to equate the symphonic band instrumentation to the number of string players in a symphony orchestra. This consisted of many doublings of instruments, creating a very thick sound texture. Most of the band terminology can be applied to this type of ensemble.